The Eleaf iPower 80W, is the ideal choice if your looking for a mod that has superb battery life to keep you vaping all day. It really will serve you well with its huge 5000mAh built in battery delivering you great performance and longevity often unseen in many built in battery devices. It is also crammed full of essential features to suit all precision vaper’s. 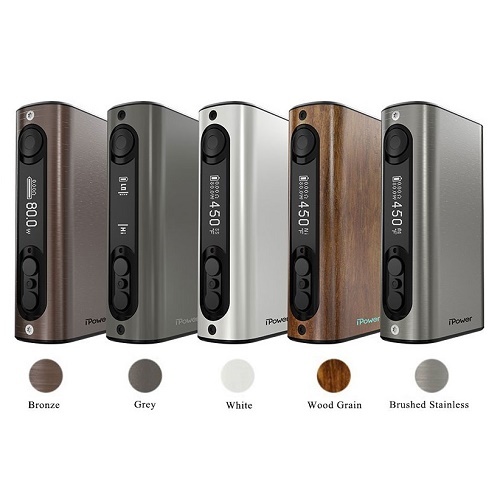 Weather in Variable Wattage mode or Temperature mode you can customize your vape exactly how you like it. It gives the option of Stainless Steel , Nickel, Titanium coils and the ability to adjust your TCR settings with 3 memory preset function not to mention the added bonus of a bypass mode, allowing you to continue vaping when on charge and also a smart mode. The Eleaf iPower is firmware upgradeable and now you can even customize your screen logo, it also boasts some pretty impressive safety features that include a circuit protection system that prevents the software , hardware and battery from over heating, over charging, over current and over discharging which demonstrates Eleaf’s safety is paramount Ethos. The Eleaf iPower is capable of a max output of 80 Watts and has a spring loaded 510 connection to house your favourite Tanks or dripper’s. The range of well suited colour scheme’s are a perfect match for this device and we must say, the Wood Grain effect pattern looks absolutely stunning. Its lightweight design is a bonus and fits comfortably in the hand with a bright OLED screen that displays all the necessary info you need. The button system has been well thought out too, with a centralised menu button in between the plus and minus digits makes for a smooth navigation through the well laid out menu and sub menu’s format. 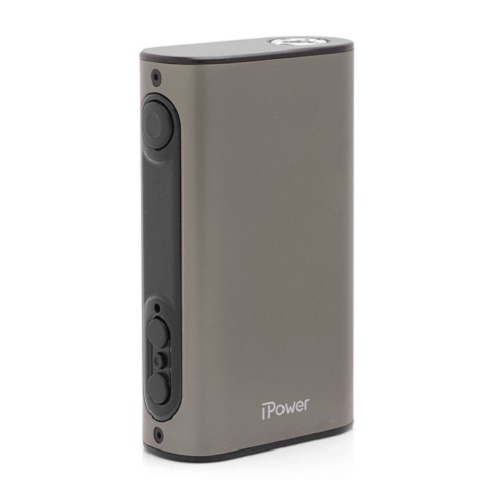 We have been extremely impressed with the sheer staying power of this device, it really does outlast its competitor’s and it’s the type of device you want by your side if your stuck in traffic or away from home for a while, with the reassurance that the iPower will go the extra few miles or hour’s for you to keep on vaping happily.